This is a wonderful article written by an experienced knitter, who happens to be blind. What a great idea! Freeform knit and crochet - no mistakes. You can use any colors, any stitch, any shape, and it all works. I love this idea. You create little collage patchworks of knitting and/or crochet, and then attach them to an object. I love the idea of renewing an old tote or purse by covering it with freeform. Or giving a sweatshirt new life. Heaven - no worries about color matching, which is nearly impossible for me. Lots of ideas for mixing in techniques, like adding in flowers from Daisy looms or other flower makers. Thank you Freeform for making my mistakes into art. 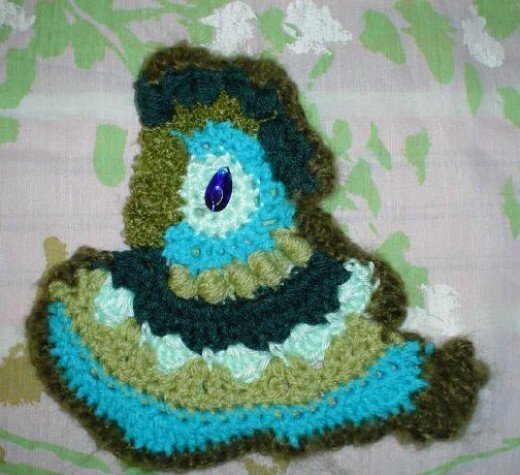 A wonderful woman named Grace Campbell has become the co-owner of the loomknittingmagazine TWITCHY FINGERS group at yahoogroups.com. She is an experienced nurse who has helped many blind and low vision people learn to knit, crochet and loom knit. Anyone can join the group. Thank you Grace! You have inspired me to try tape recording and listening to my pattern instructions. It was all the fault of the Lion Yarn catalog. The cover photograph was filled with adorable knit and crochet animals. My youngest took one look at it, and asked if Mommy would make her the bunny. Well, the Lion pattern was not something that could be loomed. Luckily, a search of the Provo Craft site gave me "Bunny Wabbit". Bunny Wabbit could be made on a small Knifty Knitter, and it looked like the perfect solution. 1. The flat knit stitch: Since I have MS, the flat stitch was a challenge for my hands. It is a tighter stitch when knit, so it was hard to work the yarn, unlike the looser bulky options. On the other hand, it solved the problem of loose stitches on the Knifty Knitter. 2. Seaming: seaming, I had thought, would be no problem, since I would be threading yarn into an embroidery needle that came with the loom. Not so fast - the plastic needle from the KK loom was too flexible, and didn't like to "push" through the yarn. Poor Bunny! Did I ever puncture him. I realized that not being able to see between my stitches was making my needlework a real challenge. I solved it by basting with a contrasting yarn to provide a guideline. This was not perfect, but it helped. 3. The button eyes - I didn't think ahead on this one. The button holes were too small for the embroidery needle, and I had to use a standard needle and thread. This took a very long time, and first chance I get, I will have someone pre-thread some needles for me to have at the ready. 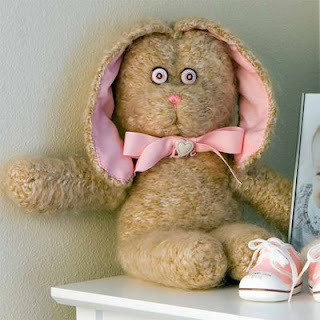 Poor Bunny's eyes are falling off already. 4. The ears - the pattern called for fabric to make the pink inside of the ears. I modified this part, and instead loomed the ears using a strand of pink fuzzy yarn along with the main color (grey). I added the pink randomly to the ears, to create a spotted effect, and used the standard e -wrap loom stitch, to save my poor hands. This gave Bunny nice, soft ears, without anymore sewing. 1. Use brightly colored yarn that contrasts with the color of the loom. 2. Forget patterns that are traditional patterns; look for directions that can be done with a measuring tape. 3. Find patterns on the Internet that can be enlarged and printed in bold type. 4. Use large gauge or regular gauge looms. Fine gauge looms are too small in size to allow our fingers to see for us. Things would be perfect for me if they were like this cupcake: BIG. Put a magnifier on the world, and I would be a happy camper. 4 months ago, I found myself in the hospital, with no vision in one eye. A few weeks later, the other eye started to slip away as well. I have some vision back, but it is a different world now, and I still want to craft. Looms - thank heaven for looms! I will get better at living this new life, but for now, I am enjoying loom knitting. Hope you will too.